When FileMaker relegated Bento to the dustbin, users of the occasionally maligned but rather excellent and exceedingly simple personal database for the Mac and iOS were left wondering what's next for the collection of Bento data they had accumulated over the previous few years. Are any applications as versatile as Bento available to take over its role? And is there an easy way to transfer your data from Bento to one of those other apps? Though some critics of Bento felt that the app was too inflexible and that it put a straitjacket on database creation, it was a slick database app that enabled users to create nice-looking relational databases without requiring much more than an interest in organizing your personal data. Turns out, finding a capable replacement is a pretty tall order. Over the past few weeks I've reviewed three apps that offer features similar to Bento: Tap Zapp Software's TapForms (), Apimac's iDatabase (), and Giowisys Software's Symphytum () For this story I also looked at Filemaker Inc.'s flagship FileMaker Pro, as a slightly more expensive and far more capable alternative. Each offers useful database tools--some of them better than Bento's, but most of them not. Which of these apps gives you the best options for importing your existing Bento data? The short and unsurprising answer is FileMaker Pro. TapForms, iDatabase, and Symphytum only offer options for importing data files in their native formats or as comma-delimited (CSV) files. Bento has no problem exporting data in a CSV format, but, since CSV files are text files, they can contain only text data. If you have any images stored in your Bento database, they will not show up in your new database. FileMakerPro is the only app that provides an option for importing your entire Bento database--including images and, if you've created relational databases, the relationships between your various files. One feature that made Bento such a great app was its collection of templates, supplemented by the user-submitted templates available on Filemaker's Bento Template Exchange. With more than 25 choices, Tap Forms offers twice as many templates as any of the other apps. These templates are by no means beautiful, but they do supply forms containing a number of useful fields that may give you a starting point for creating new forms of your own. For its part, iDatabase offers a collection of very basic but colorful templates that offer a good foundation for creating something a bit more sophisticated. FileMaker Pro's templates are far more sophisticated than those offered by the other three apps. Its 16 Starter Solutions' cover everything from basic contact databases to time billing and content management. As a result, like Bento's templates, FileMaker's templates offer a way of creating a complete stand-alone system that requires little customization to be useful. It took Bento a while to climb aboard the label-printing train, but when this feature finally appeared, Bento made simple work of creating all kinds of labels. With the exception of FileMaker Pro, none of the would-be successor apps to Bento offer anything in the way of label printing. Though the other three apps offer basic form creation options, you can't use their form tools to create and print labels. FileMaker Pro's label creation tools are far better than Bento's. Whereas Bento used the app's print dialog for label creation, FileMaker Pro lets you create forms for multiple types of labels. The app ships with dozens of prefab templates, but you can also create and save custom label templates for any kind of label you might find. For all its basicness, Bento offered some very good tools for creating relational databases. You never saw Bento's relational underpinnings; but if you linked two collections together, the data you entered in one collection's form showed up in another collection's data. Tap Forms offers something quite similar to what Bento did. By using a specialized field type called a Link to Form' field, you can create relationships with any of the other forms you've created. After creating them, you can use the form to add new records to the related database the form, or you can select from a list of the related database's records to add them to the database you're working with. FileMaker Pro's relational capabilities, though stellar, are a bit complicated to locate and navigate if you're new to the idea of creating relational databases. Several of the app's templates offer files with relationships to multiple databases. But using FileMaker Pro to create your own relationships between files is much harder than doing the same thing with Tap Forms or Bento. With the exception of FileMaker Pro, none of these apps gives you much power to customize the forms you've created. Once you've created your database, these apps' forms display every created field in linear fashion from top to bottom. You can't create more than one form for a database, and customization is limited to moving fields vertically on a form. You can't place fields next to each other, and the first field you create when using iDatabase becomes a key field, meaning that it must always be the first field on your form. 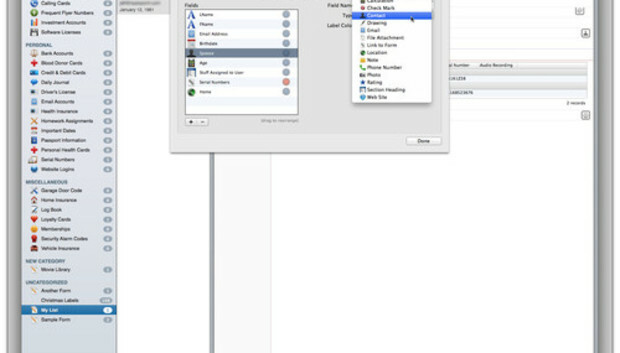 FileMaker Pro allows you to customize in almost any way you can imagine. The form creation tool can be a challenge to master; but once you become proficient, it gives you an incredible amount of form creation freedom. Regrettably, no personal database app completely replaces Bento. Though the basic apps--and Tap Forms, in particular--offer some of the tools you may have grown to love in Bento, none of them rise to the same level of simplicity and capability that Bento did. The only real alternative is FileMaker Pro, which easily imports your existing Bento data, offers a powerful collection of database tools, and supports the kind of customization you've grown used to with Bento. But FileMaker Pro is not designed with simplicity in mind. So while it offers more than any of the other apps do, it may also be considerably more than you want or need. Anonymous vs. ISIS: What does it really mean? Paris attack: Will it take 'cyber 911' for people to see the risk?